Mickey loves home made dog food and treats. I will be sharing some of his favourite ones now and then. Home made is so much more healthier for your pet, and is free of preservatives, fillers, and chemicals that are often found in commercial dog foods. Any left-overs may be stored in the fridge, for up to 4 days. Or, individual servings may be frozen for future defrosting and feeding. Combine all ingredients and serve or freeze half depending on the size of your dog. 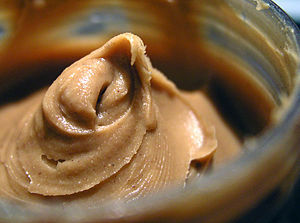 Mix dry ingredients together then mix in the peanut butter and hot water. Add more flour if the dough is to sticky. Knead the dough well on a floured surface then roll dough out to a 1/4″ thickness. Cut into whatever shapes you want. Once on the baking sheet brush the biscuits with an egg wash to give them a nice sheen when cooked Bake in the oven for about 35 minutes, then let cool in the oven overnight. This recipe makes biscuits that can be stored in an airtight container for 1 week. 3 weeks in the fridge or for 6 months in the freezer.